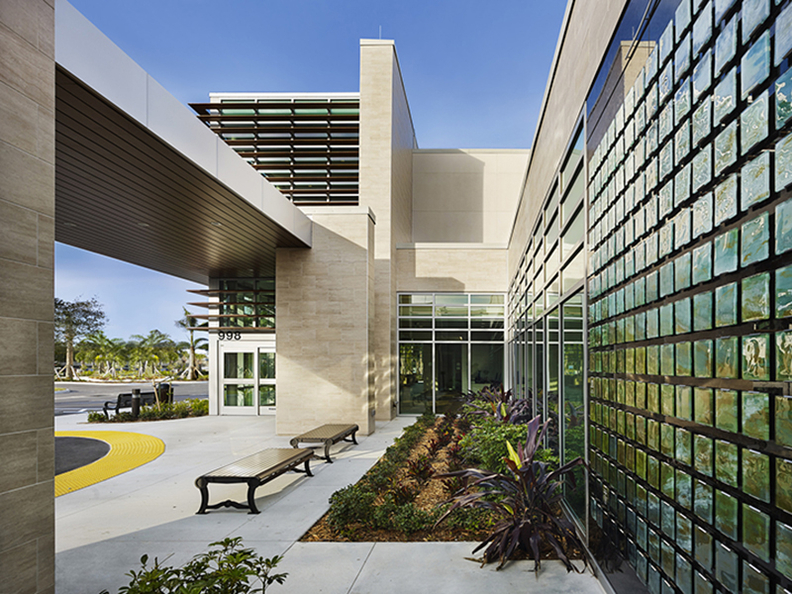 The completion of the $14 million Indian River Medical Center Scully-Welsh Cancer Center in Vero Beach, Fla., finally gave locals a reason to stay in town for their treatment. Rather than continue to send patients away, the hospital enlisted Array to develop a 20,000-square-foot addition to the existing radiation oncology pavilion as well as integrate the outdoor environment into the space. To accomplish that goal, the firm had to balance the sensitivity some cancer patients have to sunlight with the desire to bring in natural light and create outdoor spaces. The design includes floor-to-ceiling windows and infusion suites that provide a close-up view of the gardens. Design award judge Mary Frazier, of EwingCole, noted that each examination room had a direct view of nature, a difficult feat to accomplish. The architecture firm used deep Lean process analysis when designing the workflow and was able to shave 45 minutes off patients' infusion treatments at the cancer center. The design choices also give control back to cancer patients and their families. “The staff is able to operate as patients exercise their own control within their predefined parameters,” Bykowski said. “It's set up so there's a lot of microchoices that patients and their family members can make during their treatment,” such as privacy preferences and degrees of staff interaction. Lead designer Kent Doss of Array noted that those design choices “rehumanize the process” of going through cancer treatment.